We purchased this bed skirt along with the rest of the Rory bedding collection. It really completed the set and made it all come together. Because of the print/ neutral color of this bed skirt it could very well be used with many other styles of bedding. It's well made and looks nice with our country/farmhouse decorating style. Would purchase this item again. We're mad-for-plaid in the Rory Bed Skirt. Chocolate, creme, and almond windowpane plaid dominates in this all cotton skirt. The skirt is finished with a gathered ruffle with 16" drop. 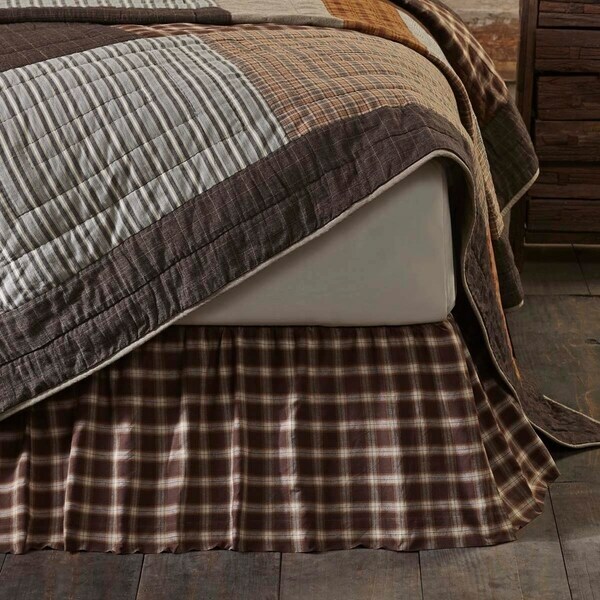 This bed skirt goes great with the Rory quilt and the Rory pillow shams. It is a tad bit big but doesn't really affect the look. I love the colors. I would definitely recommend it. I wanted to duplicate the look of the quilt with the bedskirt, so this was a no brainer. It will call for some ironing, but that is a small price to pay for quality all the way around. I heartily endorse the Rory set! It goes with the rory quilt bedspread and the rory pillow shams I have already purchased.